Top Chef Charleston Recap: It’s Jeremiah Tower! We begin this week with Sheldon reflecting on his good fortune: “I couldn’t have asked for a better final three.” On the one hand, Shirley is great! On the other hand, Brooke is great! And Sheldon, he is also great! Whoever goes home tonight, it will be devastating. And since there is no better place to be devastated than a luxury adults-only resort, everyone heads to the Yucatán Peninsula for a stay at Secrets Akumal Riviera Maya! (Shhh.) “We have arrived in paradise!” marvels Sheldon, as they roll into paradise. “Are we in a Jay Z video right now? Let me get my mink coat on and pop some bottles, because this place is on another level.” Much like in a Jay Z video, everyone then goes snorkeling with sea turtles. After a quick night’s sleep in Paradise HQ, the chefs take off for Valladolid, in the heart of the Yucatán, which Padma promises is going to get hot, if you know what she means. (Brooke does not know what that means.) Luckily, Padma and distinguished Mexican chef and culinary anthropologist Ricardo Muñoz Zurita are here to explain: “The ingredient you’re going to be working with is going to make you sweat,” offers Padma, mysteriously. It’s a habanero challenge! Everyone gets an hour to gather ingredients at the local market, and then must prepare a dish showcasing the iconic pepper of the Yucatán: the humble habanero. As everyone cooks, Sheldon is having trouble with his queso fresco — stuffed chayote squash — because his “queso fresco” is actually a tamal. Not to brag, but I totally knew that when the woman at the market pointed to it and said, “tamal.” No matter! Sheldon, visionary and gentleman, is going to use it anyway. On the whole, kindly, Ricardo Muñoz Zurita likes everything. He raves about Shirley’s masa dumplings, which he says are “very smart,” but he also can’t get enough of Brooke’s “refreshing” pork tenderloin with assorted hot-and-sour salsas. He even musters up some nice things to say about Sheldon’s pan-roasted squash, although it was too spicy, and bafflingly filled with tamal bits. After zero minutes of deliberation, Ricardo announces the winner: For a change of pace, it is Brooke! Brooke tries to contain her cackles of victory. 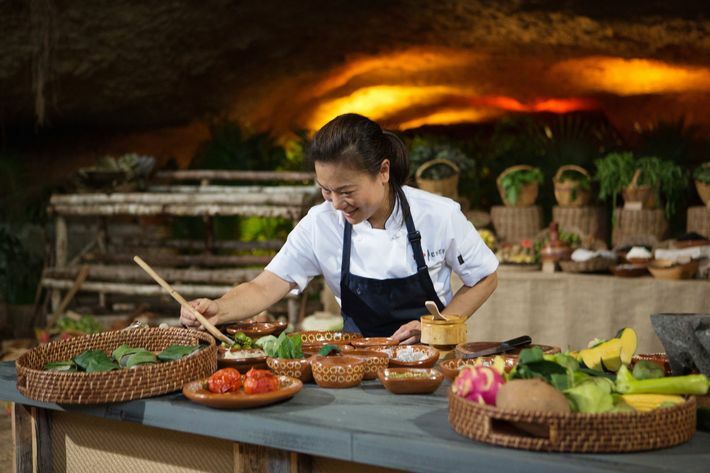 After a quick lecture on the history of the Maya empire (old) and its influence on modern Mexican cooking (big), Padma announces the Elimination Challenge, which is to create a dish like the Maya used to do it, using only traditional Maya ingredients — such as chayote squash — and traditional Maya tools — such as flames. “No tools? No blender?” gasps Shirley. “This sounds really crazy!” They will, however, be allowed to keep their knives, because the Maya also cut things. 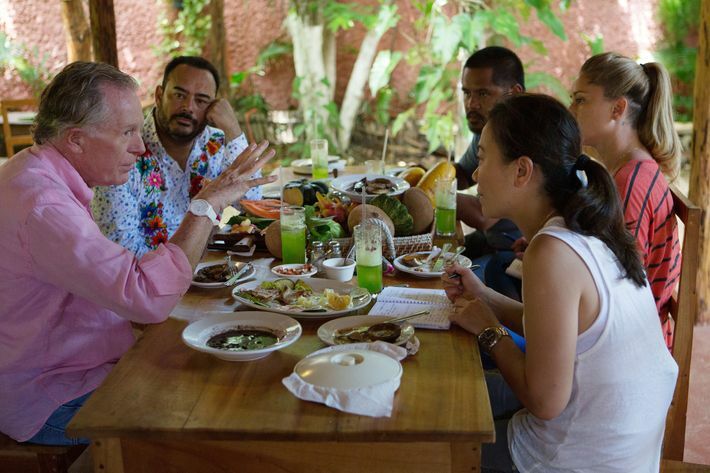 To teach them the ways of the Maya, Padma sends them off with Jeremiah and Ricardo, who introduce them to a host of pre-Colombian foods and techniques. Back in modernity, Shirley makes everyone drink piña coladas. At last, the hour has come: It’s cook time! Armed with nothing but their knives and their wits, the chefs steel themselves for battle amid the ruins of civilization past. “It’s a bit like an Indiana Jones movie,” observes Brooke. “I’m kind of expecting to see a pile of skulls somewhere.” Across an ancient sinkhole, Sheldon is tearing apart some crabs with his bare hands. Oh, it’s a rough one! Brooke doesn’t know what she’s doing, so she focuses on figuring out if snapper sticks to the grill. Surprise! It does, so she’s forced to wrap her fish nuggets in hoja santa leaf. Shirley is also wrapping fish fillets in hoja santa, but the difference is that she’s doing it with aggressive enthusiasm. Undeterred by the fact that everyone else is leaf-wrapping their fish, Sheldon decides he’s going to grill his yellow snapper directly, because that is his rustic vision — and to thine own self be true, or something. What could possibly go wrong? (It could stick to the grill.) “This is not looking good,” Sheldon groans, staring into the abyss. And here comes our jolly binational judging panel! It is made up of everyone we’ve seen, and also some people we haven’t. Brooke’s hoja santa leaf-steamed snapper with bean and corn ragout, jícama-papaya relish, and avocado is up first, and there is a lot going on. Still, everyone agrees her fish was truly exquisite, even if the rest of the dish was confused and overwrought, but also bland somehow. That’s basically the inverse of Sheldon’s whole grilled snapper with crab sauce, Yucatán vegetables, and habanero salsa, which has great flavor and terrible fish. Tom doesn’t waste any time: “You broke up the fish to mimic crab, or did you just mess up the grill?” He did not, Sheldon says, and Tom is annoyed at his honesty. 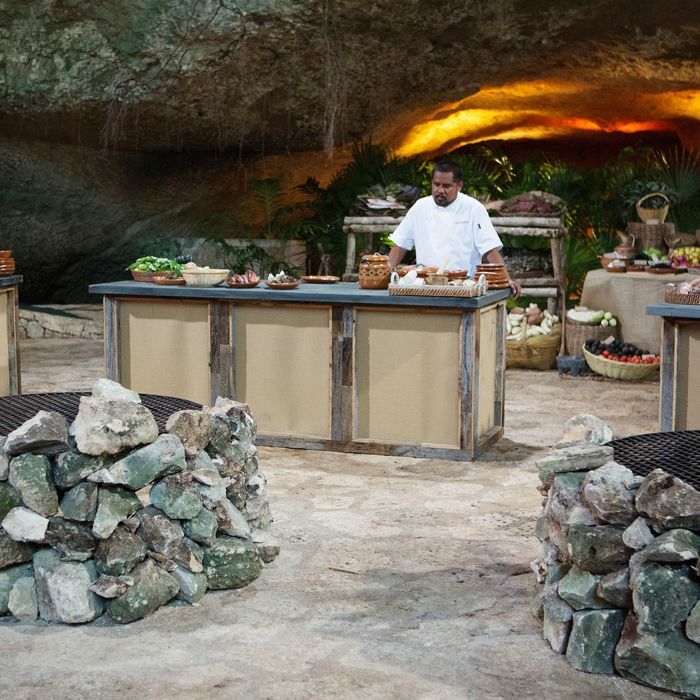 Top Chef Mexico’s Guillermo Beristain tries to argue that Sheldon took bold chances, but Tom is not having it. Frankly, Tom seems a little grumpy tonight. He cheers up a little bit for Shirley’s leaf-grilled grouper with habanero-tomato sauce, though, which is a universal hit. “That girl can cook!” opines Jeremiah Tower. Jeremiah then does the honors: The winner is Shirley. “Are you serious? I made it! I made it! Oh my god!” Shirley squeaks, weeping. “I get to cook! Oh, I can’t wait to show you!” I am filled with a feeling I can only describe as love.